There are two types of CourseWorks guides: general subject guides and course-specific subject guides. For a general subject guide, you will need the four-character department code (PHIL = Philosophy). For a course-specific guide, you will need the four-character department code and the course number (HIST = History Department; course number G4000 Section 001). Editing an existing guide is simple! 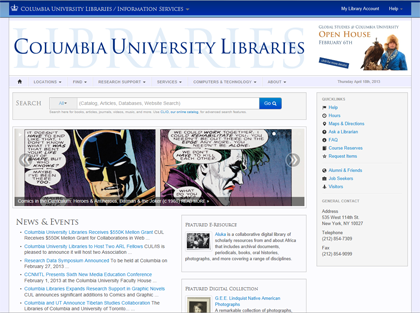 Just log in to CQ and navigate to your guide (under CourseWorks in LibraryWeb). Determine whether the department already has a section in the CourseWorks area. Most departments do. If the department has a section in this CourseWorks list, a "shell" for the general guide already exists. From the content tree (in the left portion of the Website Console), click on the department’s parent page (these top-level pages are place holders used to direct CourseWorks to the appropriate URL). A list of the child pages should appear in the Page Details panel to the right. If there is one listed with a name that is just the four-character department code (e.g., PHIL), that is the general guide for that area. Right click on the title to open and begin editing. From the content tree, navigate to the department section in CourseWorks. Click on the parent page of the department to view its contents in the Page Details panel to the right. Select "New Page" from the drop-down menu at the top of that panel (above the title of the first page listed). Give your page a title that relates to the course. NOTE: If you are creating different guides for different sections of the course, you will need to include the section number in the name too (e.g., HISTG4000003 for Section 003). Otherwise, the course sections will automatically link to the HISTG4000 guide. Click the Create button (the CourseWorks template is the default template in this section and should always be used). Your new guide should appear in the list in the Page Details panel. Right click on the new guide’s title, and select Open to begin editing. This entry was posted in Creating Content, Websites (CQ/AEM) on August 10, 2011 by Candice.